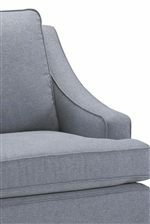 This accent chair is like a two-for-one deal- it packs both a chic, classic look and the incredible comfort of a glider rocker. 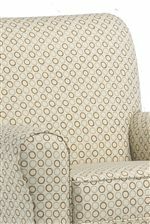 Use this traditionally-inspired chair as a cozy seating addition for your living room, bedroom, or child's nursery. Features a smooth, glider rocker motion and 360 degree swivel- perfect for multi-tasking with kids or grandkids. Contrast Welt Cords Shown. 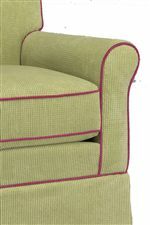 Also available without contrast cording. The Storytime Swivel Chairs and Ottomans Eliza Swivel Glider with Skirted Base and Button Tufting by Best Chairs Storytime Series at Best Home Furnishings in the St. Louis, Chesterfield, St. Charles, MO & Waterloo, Belleville, Edwardsville, IL area. Product availability may vary. Contact us for the most current availability on this product. The Storytime Swivel Chairs and Ottomans collection is a great option if you are looking for Transitional Traditional furniture in the St. Louis, Chesterfield, St. Charles, MO & Waterloo, Belleville, Edwardsville, IL area.